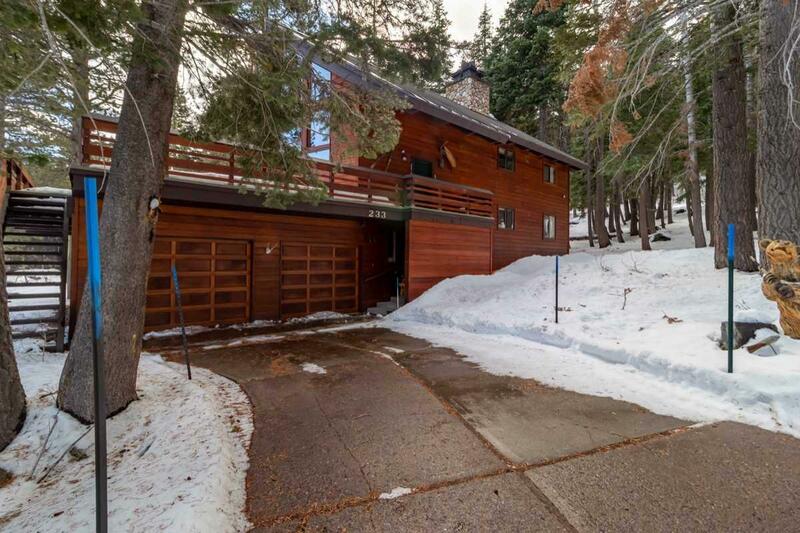 An opportunity to own a home in Mammoth Lakes that sleeps your entire family, has ample outdoor living space, a quiet forested setting, a long driveway, massive deck space, outdoor jacuzzi, east and south facing sunshine, and garage space to store all your toys. This property is located at the area near the top of Old Mammoth Road that borders both 79-acres of Inyo National Forest land, and the 156-acre Valentine Reserve Ecological Study Area; a reserve of Eastern Sierra land administered through the University of California, Santa Barbara. As a result, it is common to experience an abundance of wildlife roaming around the property throughout the Spring, Summer, and Fall months. The outdoor jacuzzi and firepit were built off the house on a custom deck that is both elevated over the open backyard area, as well as enclosed in by glass on the sides. This provides an "Alpine Safari experience as you relax outdoors in the comfort of the homes amenities. During the night, turn on the exterior lights that are strategically positioned in three locations to light up the forest and further showcase the homes serenity, or keep lights off while soaking in the jacuzzi to gaze up at the Milky Way in this area of Mammoth that is free of most light pollution. The home has an upgraded kitchen with an indoor grill and solid Pecan wood, three fireplaces, forced air heating, and a separate family room. Convenient layout with 3-bedrooms and 2-bathrooms downstairs that all flow into a family room that is equipped with its own fireplace, foosball, TV and couch, minibar and more. From here head out the sliding glass doors to the extensive multi-level decks that embrace the views and outdoor tranquility of the home and its amazing location. Or head upstairs for the massive living room and dining room and gorgeous kitchen. Surrounded by panes of glass, enjoy the views here from within the warmth of the home sitting at a nice family dinner, or cozy by the upstairs fireplace.